There is a marvellous unity to the Bible story even though it was written by many different people over many hundreds of years. There are two great differences between them: the garden has only 2 people in it; the city is full of people, all those whose names are written in the Lamb’s book of life. Only God walks in the garden; the Lamb walks with him in the city and the people walk by the light of the lamp, which is the Lamb. Wow! And triple Wow! Unfortunately I find it difficult to write this chapter because there is so much disagreement about how we should understand what the Bible says about the End of the Ages. That Jesus Christ will revisit the scenes of his triumph, his death on the Cross, is beyond doubt. What will happen to us is much less clear. The popular picture seems to be of us sitting on the clouds, playing harps, but that is an old idea from a few hundred years ago and is not the Biblical picture at all. About 200 years ago the idea was spread about that when 1 Thessalonians 4: 17 says “For the Lord himself will come down from heaven, with a loud command, with the voice of the archangel and with the trumpet call of God, and the dead in Christ will rise first. After that, we who are still alive and are left will be caught up together with them in the clouds to meet the Lord in the air. And so we will be with the Lord forever,” means that the Lord will come halfway to earth to collect his people and take them back to heaven with him in what is called the Rapture. But that is not really the picture here. The scene reflects what happened if Caesar visited a city in one of his outlying provinces. The people of the city would come out to greet the Emperor and then escorted him on into their city. Caesar kept going in the same direction; it was the people who reversed their direction. Yet in the popular teaching of the Rapture it is the Lord who reverses while the people keep going in the same direction! I cannot begin to unravel which is correct. Fortunately Jesus himself said: “But about that day or hour no one knows, not even the angels in heaven, nor the Son, but only the Father.” And we should heed that warning. The book of Revelation is a an uncertain guide here for there are so many ways to understand its amazing images, but it is useful to illustrate what the more straightforward parts of Scripture say. This says that our final destination is not heaven, floating in the sky, but here, on earth, part of the New Heaven and New Earth. When John was writing he said that there would be 144,000 people there – a big enough number that all followers of Jesus might expect to be included but not so big that all might presume to be included. (I have ignored the distinction between those described as of Israel and the great multitude. In this age we, the people of God are all Israel. ) That number is 12x12x10x10x10. If he was writing today he would have needed to add 2 more 12’s and 2 more 10’s to get a number slightly bigger than 2 billion so that we might all hope to be present but not presume on it. See you there! This is what one writer has called ‘life after life after death’. ‘life after death’ is our immediate presence with the Lord which is what Paul meant when he wrote Philippians 1: 21, 23b: “For to me, to live is Christ and to die is gain. Yet what shall I choose? I do not know! I am torn between the two: I desire to depart and be with Christ, which is better by far”. Unfortunately this is what there is so much argument about. This is the promise for all of us that believe in Jesus and seek to follow him. It is hard to get your mind round how the New Heaven and New Earth could possibly be. Sitting on clouds is far easier to think about, but this is what Scripture and therefore the Lord tells us. 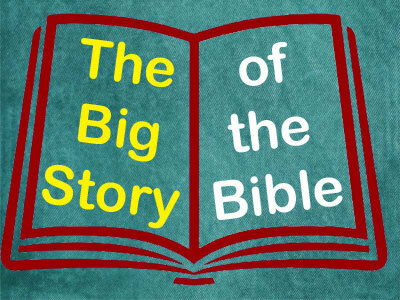 It will be obvious to you that I have left out many things that could be included in the Big Story of the Bible. I think the really interesting one is that last Scene where I thought about the church NOW. We should not, and cannot, replicate any of the previous scenes ourselves. We can only live now. How we behave, how we act, how we serve is inevitably bounded by the world we live in and who we are. The important thing is to worship and serve the Lord within those bounds. For many of you, many of us, that means working with Dave in the WOW church, on the Internet. The Lord is Worthy-Of-Worship indeed. Our way may well be in this very new, very different, very important development. Go to it! Yes, I know! The church today is not really part of the Biblical story in any direct way, but there is another chapter to come on the Church at the End of the Ages and it would leave rather a long gap to say nothing about the in-between times. All of church history could be here but that would be far too much so I will only say anything about one previous event: the Age of Reason, the Enlightenment, of some 300 years ago that has affected so much of our present Western culture. More of that later. We live in an amazing and very exciting period of church history. There are more Christians of every sort alive today than ever before; in fact, more alive now than all that have ever lived and died; one third of all the people on the earth. This is mainly because of the recent huge growth of the church in Africa, South America and, to a lesser but increasing extent, in Asia. At the same time the old core areas of the Faith in Europe and North America have declined somewhat, so the centre of gravity of the World-Wide Church has moved south and east. At last the glorious vision of Isaiah 43: 6, 7 “I will say to the north, ‘Give them up! ’ and to the south, ‘Do not hold them back. ’ Bring my sons from afar and my daughters from the ends of the earth — everyone who is called by my name, whom I created for my glory, whom I formed and made.” is being fulfilled as the followers of Jesus now make “disciples of all nations”. One other remarkable factor is worthy of note. For the first time since the days of the Roman Empire there is one language understood through nearly all the known world. Then it was Greek; now it is English. It is not the language spoken by the most people as their mother tongue but, thanks to the Internet, it is the most widely understood language. And hey! – you guys and girls out there and listening to this are at the very forefront of this great development. Congratulations! Of course, being a partly human institution not everything in the World is perfect. Obviously, resurgent, militant Islam is a concern. How is an essentially peaceful faith (in spite of some bad mistakes such as the Crusades) to react to an aggressively warlike one? That dilemma has never been satisfactorily resolved in these nearly 2000 years of the church. How deep in spirituality and knowledge are all those billions of Christians? In one country I was in I was reliably told that there were so called ‘Christian villages’ where not one single person in the village knew who Jesus was! Where were all the people from the better developed Christian world who should have been out there teaching them? Then there are all the deep problems in Europe and North America that stem from the Enlightenment. 300 years ago in Europe, men, fed up with the interminable religious wars of the previous century, turned to human reason as the best judge of what is right or wrong. From that move has come the modern Western idea that each person is autonomous, that is - able to make up his or her own mind about how to live, whether to believe or not, and what to believe. The result has been apathy to faith in Europe and consumer oriented churches in North America. Both have led to a sad decline in true faith and personal commitment. That is a hard question to answer when these words may be read or heard in so many different places by people in so many different cultures and circumstances. Let me repeat what I said before to try and hammer it home (! ): we, Dave Roberts and all his band of helpers, are trying to use the new opportunities that world wide interconnections and the use of the English language open up so effectively in the service of the Good News of Jesus Christ. Make sure this is made as effective as possible. Tell other people how to connect to Dave’s sites. Share what we say and write with other people. Translate as much of it as you can into your local language, if that is not English, and then spread it as wide as possible. By all means and in every possible way join in this great enterprise of the World-Wide Church and our little corner of it. May the Lord bless you as you do so. The story is not finished. We are ourselves part of it. Mark begins his Gospel by calling it the “beginning of the Gospel” perhaps hinting that there was a lot more to come after he had finished writing. If so we are part of the continuation of the Gospel. The first 20 chapters of the book we call the Acts of the Apostles are devoted to 3 main themes: the giving of the Holy Spirit to all the followers of Jesus; the understanding that the Christian Way is open to all: Jews and Gentiles; and the spread of the Good News round all the eastern end of the Mediterranean Sea. All these are very important for us. The remaining 8 chapters of the book are concerned with various legal arguments surrounding Paul and his work. These were important to Luke writing to encourage his patron, Theophilus, to follow the Way but are far less important for us. First then: the gift of the Holy Spirit. You are probably familiar with the way in which the Spirit was initially given to the 120 immediate followers and companions of Jesus. In Jerusalem this, and the subsequent occasions when the Spirit was given, was followed immediately by the gift of Baptism, thus closely associating the two events. Only when Philip went to Samaria, an area of people despised by the Jews of Jerusalem, and they were converted and received the gift of the Spirit did the Jewish leaders begin to realize that the gift was going to be given to Gentiles as well as Jews and that therefore they were going to have to be baptized as well. The situation was formalized through the experiences of Peter with Cornelius, not without some vocal opposition. In tracing through the way in which people were given the gift of the Holy Spirit we see that the Christian Way is open to all, Jew and non-Jew alike - which is just as well for us as probably most of you who hear or read this will not be Jews! An important but usually overlooked episode in the life of the early church is the time Paul spent in Arabia that he mentions in Galatians 1. We may reasonably guess that he spent his time there in a Jewish seminary which had a complete set of what we call the Old Testament scrolls and gave himself a PhD course in ‘The significance of Jesus in Old Testament prophecy.’ When he had finished he had worked out a complete theology of the meaning of all that had happened since the beginning of the ministry of John the Baptist in Galilee. Unfortunately we never get to read his complete thesis but only the snippets that were appropriate in the letters he wrote reacting to specific situations in the young churches. A naturally dynamic person, energized by his studies, Paul embarked on his amazing life work of spreading the Good News and planting churches throughout what are now Syria, Turkey, Greece, Macedonia and Rome. What a man! What a gift! What a Holy Spirit! And what about you? What is your particular gift? Think about it; pray about it, use it. The most difficult part of the Big Story of the Bible to talk about is the Resurrection of Jesus. The big question is ‘did it really happen?’ All those of us who live in the modern Western world are in a culture that says it did not. The primary reason for this is that our culture says something is only true if it can be replicated. If an experiment carried out in the USA is true it must be possible to repeat it in Australia for it to be legitimate. And, of course, the return to life of the dead Son of God is the ultimate event that cannot be replicated. The assassination of Julius Caesar cannot be replicated either, but many national leaders have been assassinated in recent times so that is a near enough repetition for that ancient event to be accepted as having truly happened. But the resurrection of a man from death is another matter altogether. How do we get out of this problem? Part of the answer is that this is not science but history. History never exactly repeats itself, either in the event or its description. We must not, and cannot, treat historical events in a scientific way. Also we have to challenge the underlying assumption that the possibility of replication is always necessary. We see a beautiful sunset and admire it but it can never be replicated. A person’s love for their spouse can be neither explained – why this person and not that person – but is none the less real and cannot be replicated. Many, if not most, of the good things in life that we enjoy are beyond replication. The attempt to say that the resurrection, the best attested of all ancient events, did not really happen is a philosopher’s trick to try to stop people believing. The Biblical attestation is complete and total. When Paul says: “Jesus appeared to 500 people at the same time”’ he was obviously implying “if you don’t believe me go and find one of them and ask them”! Those who say the resurrection was, and is, impossible have to explain what happened in or near Jerusalem to cause such an explosion of growth of a movement which did not exist in AD 1, but was thriving so well 100 years later that there are many non-Biblical references to it. Also why would those who had been close to Jesus have been prepared to die for an idea and his teaching if they knew them to be lies? The resurrection of the Son of God is a fact. What did it mean? What did it achieve? Where and how does it fit into the over-all story? Two words used by computing people are useful here: verification and validation. You probably don’t know them. Let me explain. Verification is the process that checks a computer program does what it should do, that is, that it fits the specification. Jesus claimed to be the Messiah, the Son of Man (of Daniel’s prophecy), and the Son of God. So far he had only his good works, his healings, his exorcisms, his miracles and his words to back up that claim. His return from death 3 days later, as they counted, 2 days as we count, verified all his claims. He was the Messiah, he did fulfil prophecy, he was the representative figure of the nation that Daniel talked about; he was in some mysterious yet definite way the embodiment of the Lord God walking on this earth. Validation is the process that shows that a computer system works, it is useful, it does what it was intended that it should do. Paul says in the last verse of Romans 4 that “He was delivered over to death for our sins and was raised to life for our justification”. The first part is easy to understand – Jesus died to redeem us from the guilt, penalty and power of sin. But “raised for our justification” is not so easy. If we translate it “raised to make us righteous”, which is legitimate for justification and righteous come from the same Greek word family, different though they are in English, things become easier. If Jesus had not been raised there would have been no continuing life force available for his people. The last verse of the next chapter says that Jesus died that “grace might reign through righteousness to bring eternal life through Jesus Christ our Lord.” The resurrection of Jesus has brought eternal life, the life of the Ages, to his people, life that depends on the Spirit that is the possession of all those who belong to Christ. As Romans 8: 9 says “if anyone does not have the Spirit of Christ, they do not belong to Christ” . Because Jesus rose from the dead this story does not end here: there is still another Act to go: the story of the Church, including the story of you and me. We live in the power of the resurrection interpreted to us by the Holy Spirit. We are servants/slaves of the Lord of Creation. Paul says in his letter to the Colossian church: “The Son is the image of the invisible God, the firstborn over all creation. For in him all things were created: things in heaven and on earth, visible and invisible, whether thrones or powers or rulers or authorities; all things have been created through him and for him. He is before all things, and in him all things hold together. And he is the head of the body, the church; he is the beginning and the firstborn from among the dead, so that in everything he might have the supremacy. For God was pleased to have all his fullness dwell in him, and through him to reconcile to himself all things, whether things on earth or things in heaven, by making peace through his blood, shed on the cross. Once you were alienated from God and were enemies in your minds because of your evil behavior. But now he has reconciled you by Christ’s physical body through death to present you holy in his sight, without blemish and free from accusation”. The resurrection is the promise to us that death is not the end. There is something more to come. The Jews always expected a resurrection at the end of time. The surprise to them was that one man was raised ahead of time as the first fruits; the first fruits promised an agricultural community that the rest of the harvest would shortly come. We may not be agricultural people living in the country but the same is true for us, town and city dwellers though we may be. Christ has risen; one day – so shall we. Yippee! And so we come to the pivotal moment of history. It is hard to know what to write about it. In all probability anyone and everyone who listens to this, or reads it, will know the details of what happened and if I am telling the story of the Bible this is perhaps not the best place to go into the detail of what the death of the Son of God on the Cross meant. What I am going to do, therefore, is try to relate the great event to all that has happened in the Great Story so far. We started with Creation. The fundamental point of Genesis chapter 1 is that men and women are made in the image of God and therefore are uniquely endowed with conscience and insight into all that surrounds them and happens to them. If we are made in the image of God then it follows that it is possible for God to walk this earth in the form of a man, as indeed he did in Jesus, the embodiment of God in human form. He died as the Son of God and as a human being. Next came the Fall, when mankind started to show their persistent tendency to disobey God and to fail to live well with each other. Jesus did not sin. The writer to the Hebrews says: “we do not have a high priest who is unable to sympathize with our weaknesses, but we have one who in every respect has been tempted as we are —yet without sin.” Jesus died, falsely accused of plotting to destroy the temple, committing blasphemy and threatening insurrection against Rome. None of those things were true – at least in the way those who heard him interpreted them. This was the pivotal moment when the Fall was reversed – at least in potential. The commission and promise given to Abraham were designed to begin the process of calling the whole world, all mankind, back to obedience to God the Lord. The great commission then moved on to his family and then the 12 tribes of Israel. They were redeemed out of Egypt to show the power of redemption and to set them on the long and difficult path of obedience to the Lord that they had in their midst as they travelled through the wilderness. But they failed. They began to fail at the very beginning, in the episode when they worshipped the golden calf as their saviour from Egypt - and from there it was all downhill. Eventually the visible presence of the Lord in the centre of the nation had to be removed from them. It could get no worse. All they were left with was the promise of a man, a Messiah, anointed of God, who would, they thought, restore them as a kingdom and a nation. But when the Messiah, Jesus, came he had quite other purposes and plans. They did not recognize him, largely because those purposes and plans were so very different from those they expected him to have. He was not a warrior leader. He did not challenge the hated Romans. He was a peaceful bringer of healing, who taught the value of peacefulness, calm, good inter personal relationships and love; all these things were part of the Kingdom he was introducing; all would only be attained by submission to the Lord God and to himself. He taught that the way up to communion with the Lord God was down to service and faithfulness. All this strange and entirely unexpected mixture of attributes came together in the person of the prophet from Galilee, Jesus. The move back to God away from the primeval sin of mankind had started with one man, Abraham. It had continued through, first, one family – that of Jacob/Israel, then 12 tribes, the nation of Israel. But they had all failed miserably through many centuries to carry out Abraham’s great commission so it came back down onto the shoulders of just one man, the perfect, obedient Israelite, Jesus. Only he could atone for both the original Fall and the consequent failure of all men and women to live in true obedience to the One and Only Lord God. This was the Glory of the Cross. That was the deepest depths of degradation, but in it we see the Son of God, God himself, lifted up for all the world to see, to follow and obey. Ever since mankind has struggled to express the full meaning of what happened there. Two main ideas have dominated: atonement and victory. Atonement is to make a satisfactory payment for something done wrong, in this case a sacrifice. It makes what was separated ‘at one’ (as the word suggests), in this case to bring together the sinner and his Lord in spite of the fact that one is sinful and the other pure and holy. Victory, expressed in the Latin tag ‘Christus victor’, represents the idea that at the Cross Jesus conquered all that was against mankind. This could only be in potential as sin is clearly still rampant in the world; and in potential as the final victory for the believer will only be achieved on death and entry into the life after death. And we can do no better than that - Glorying in the Cross. An amazing thing to do. Funny how many people wear a miniature of a scaffold round their necks and churches put a replica high on their building! But that is part of ‘the way up, is down’. As we do that glorying we shall find that our hearts and minds are strangely warmed. Thank you – Jesus, Lord and Saviour. Of course we are now approaching the climax of the Biblical story: the life, death and resurrection of Jesus. But there is a curiosity here. The ancient creeds of the Christian church say things like: … born of the Virgin Mary, suffered under Pontius Pilate … without a word about his life in between. We, too, give a great deal of attention to Christmas and Easter, but probably not so much to his life in between. Yet, at a rough count, there are only 4 chapters in total in the 4 Gospels about his birth, 14 about his death, but no less than 73 about his life in between. What, in our excitement about his birth as a human being, the incarnation, and his death, for our salvation, are we missing? The stories all 4 gospel writers tell concentrate on 3 things: first that Jesus was the long expected Messiah and secondly and closely associated with that that the Kingdom of God had arrived, and thirdly that this Messiah and this Kingdom are not as expected but modest, humble, quiet and suffering and therefore, very surprisingly, are the nature of God himself. Jesus clearly knew that it was of fundamental importance that these facts should be seen and understood by the people amongst whom he lived and taught before his death on the Cross. The Jews of Jesus’ time might well ask how did what was happening fit into that? And they did ask, many times and in many ways and could not understand it. It was David’s heirs who were supposed to rule over the Lord’s people, not the Romans and their puppet kings who were actually doing so. In particular there was to be one man, David’s heir, the Lord’s anointed, the Messiah who was to lead the people of God. Where was he? Then there is the prophecy of Daniel: “In my vision at night I looked, and there before me was one like a son of man, coming with the clouds of heaven. He approached the Ancient of Days and was led into his presence. He was given authority, glory and sovereign power; all nations and peoples of every language worshipped him. His dominion is an everlasting dominion that will not pass away, and his kingdom is one that will never be destroyed.” He was to rule not just Israel but all nations. Why was that not happening? John the Baptist was put in prison and from there he asked a very specific question of Jesus: “Are you the one who is to come, or should we expect someone else?” by which he clearly meant are you the Messiah, David’s heir of the Psalms, the son of God of Daniel, or not? Jesus replied in words that closely followed the statements of Isaiah chapters 35 and 61, “Go back and report to John what you hear and see: The blind receive sight, the lame walk, those who have leprosy are cleansed, the deaf hear, the dead are raised, and the good news is proclaimed to the poor. That was a very loud and clear ‘yes, I am the Messiah’. Then again in John chapter 2 we read that Jesus said: “Destroy this temple, and I will raise it again in three days.” John explains that the temple he had spoken of was his body. So Jesus was saying that he was the replacement temple, the new place where God was specially present. We saw in our last scene from the Old Testament that the temple was the dwelling place of God and that in any spiritual sense it had been completely removed from the building in Jerusalem. Only now is it back again in the person of Jesus. Jesus called himself “I AM” on some 14 occasions according to John. Seven times this was with another word such as ‘I am the bread of life’, but on another 7 occasions he said ‘I AM’ with no other word (usually translated I am he) thus using the Old Testament word for God. He could not have made who he was clearer. If he was the Messiah that meant his kingdom had arrived. Matthew tells us Jesus said, “Repent, for the kingdom of heaven has come near” and proclaimed the good news of the kingdom. And, of course, he framed many of his parables with ‘the kingdom is like … ‘. Understanding of what Jesus was saying is a surprisingly modern thing. Not so very long ago there were arguments between those who thought the kingdom was what the church was doing and those who thought it referred mainly to what would happen when Jesus returned in glory. It is now clearly understood that he inaugurated his kingdom during his lifetime, that it is still here, but has not yet become clear to all the world because it is not yet here in all its eventual glory. That is summed up in the phrase ‘now, but not yet’ which is implicit in the prayer Jesus taught his disciples: ‘your kingdom come, your will be done, on earth as it is in heaven.’ Understanding and holding that tension is enormously important for all of us who seek to follow Jesus. In seeing that the Kingdom has been established by Jesus during his lifetime we have also seen that beyond any doubt he was the Messiah. And so we come to the third point: the Kingdom was not what was expected then or even what many people, even today, think it should be like. It starts with the story of a baby, a baby because of whom all the other male babies in the immediate area were killed. He was surrounded by suffering before he could say a word! Then he was a refugee in Egypt for several years. He lived in obscurity for 30 years. When he finally started to speak publically he was identified as Mary’ son and the brother of James, Joseph, Simon and Judas, or Joseph’s son, not as himself. Before long he had to go up to the great festivals in Jerusalem quietly, secretly, because of the authorities. In all that suffering he was the King of Love. He introduced into the world a much more positive idea that people should look after each other, care for the weak and struggling, be compassionate, than there had ever been before. He was the Messiah; he had founded his Kingdom, the Kingdom of God; it was not at all like the Kingdom they expected and wanted. To put it in a phrase: ‘the way up is down’. It was for Jesus. It may well be for us. He said, “In this world you will have trouble. But take heart! I have overcome the world.” In saying that he showed how complete was his understanding of human nature. It is an amazing thing that Christians, dedicated to love and peace, should be so attacked and mistreated all round the world. To be sure there have been episodes in church history where the antagonism has been merited but the general trend of church history has been for peace and love. One might wonder what the world would be like if Jesus had never lived, never taught, never set his great example of how to bear suffering. Paul understood very well the implications of setting out to follow Jesus as Lord and Master. . He said, “I want to know Christ—yes, to know the power of his resurrection and participation in his sufferings, becoming like him in his death”. All this is a hard thing to understand, hard to believe that this is really the way that it is – particularly if you live in one of the parts of the world where open persecution is not known or minimal. If however you are not so fortunate and live somewhere where it is really tough to be a Christian I think you will understand what Jesus, Paul and Peter meant very much better, and, if not exactly glorying in your difficulties, understanding that they are what strengthen and toughen the Christian and the church. In the eyes of the world these things are down and to be avoided at any cost, but in the Kingdom of our great Lord and Saviour “ the way up is down”! Most of the Old Testament is taken up with the steady decline of the life and faithfulness of Israel from the high point of the Exodus and their understanding, experience and the closeness of the Lord. To trace that decline we will follow the story of the place where the Lord was: the tent of meeting, the tabernacle and the Jerusalem temple. All that detail is clearly intended to emphasize the way in which the Lord was present with and in the middle of his people. The deeply spiritual quality of the people of God as they set out from Egypt soon begins to deteriorate. There are many references to the tabernacle in the early part of the book of Numbers as it records the movement of the people through the wilderness towards the promised land but the number of references fades away as they progress. There is casual incidental reference to it being in the land, at Shiloh, towards the end of the book of Joshua, but no reference at all in the book of Judges when they are in the land. That serves as a clear indication of the decline in the concern for the Lord as they settled in the land and their attention became absorbed with the planting of land and the general workload of the farmers that they now were. The sons of Eli tried to use the Ark of the Covenant taking it from within the tabernacle as a talisman. That idea was very unsuccessful; it was lost in battle because it was not a talisman. The Philistines had to return the ark because all sorts of problems accompanied its presence in their land. It was a sign of the deeper spiritual life of David that he organized the return of the ark to Jerusalem and endeavored to give it a right place in the worship of the Lord by the people. He wanted to build a proper temple for it to be housed in but was told that he had spilt too much blood and it would be his son, Solomon, the next king, who would build the temple. Again we can see that the presence of the Lord was in doubt. David had a good and proper desire that the presence of the Lord should be understood and honored amongst the people but there had been too much strife and blood shedding for that to be permitted. These were the people who were supposed to carry the name and the worship of the Lord to all nations. They were not doing very well! But it didn’t last and in fact goes from bad to worse. The books of 2 Kings and 2 Chronicles both record a sorry tale of bad king, bad king, bad king, good king, bad king etc. we don’t get a lot of detail, as we did in the book of Judges, but things must have been even worse. Not all the kings were in the line of David. Brother killed brother or uncle to retain the throne. It was all just the same as it is in any part of the history of those days. Idols were set up and worshipped. Prophets made their prophecies up as they went along to satisfy the king and retain their positions or were ignored or killed. The glory of the Lord, the Presence of the Lord, had left the temple. That was Solomon’s temple, which was destroyed by the Babylonians shortly after. Building of a replacement temple started more than 80 years later when the exiles returned from Babylon but there is no record that the visible presence of the Lord was ever there. The same is true of Herod’s temple, which replaced that one some 500 years later. They had lost the visible presence of the Lord symbolizing their spiritual weakness and failure. Israel had failed in their God given task. Failed badly. They had lived and acted no better than any of the other nations around them and the Lord had punished them for their failure with the exile and the general weakness of their position. It is not difficult to sympathize with them, placed as they were, between the greater nations of Assyria/Babylon and Egypt. Perhaps if the had acted in the way they should have done, honoring the Lord and working towards the fulfillment of the promises to Abraham, they would have been able to maintain their national position against the greater nations. But they didn’t so they couldn’t. Would the Lord ever return to his temple? Yes, but not as they expected. He saw the true significance of what was happening. We will return to thinking about the temple, and temples, in a later scene. For the moment try to think out how full of glee Simeon must have been. He must have been bursting with happiness and joy. So should we be – the Lord is with us. he stations himself in the middle of his people to travel with them. That is knowledge, action and presence. 1. Knowledge. When Moses, seeking authority for what he had just been commanded to do, asks what God’s name is he gets 3 answers. In Exodus 3: 13 – 15 we read: “Moses said to God, ‘Suppose I go to the Israelites and say to them, ‘The God of your fathers has sent me to you,’ and they ask me, ‘What is his name? ’ Then what shall I tell them?’. ‘The Lord, the God of your fathers —the God of Abraham, the God of Isaac and the God of Jacob —has sent me to you’”. The third one identifies him as the same God of their ancestors hundreds of years earlier. The first one, perhaps given undue prominence in English Bibles by being printed in capitals is difficult to understand. The important one is the second one; I AM, as this is the one that Jesus used to declare his own status, as we shall see later. Disclosing his name like this was a major step forward in the relationship between the Lord and his people. 2. Actions. The sequence of miraculous events carried out in Egypt through Moses as the human agent, established the uniqueness, the power and the authority of the Lord beyond question. (One example is in Exodus 7: 8 – 13) “The Lord said to Moses and Aaron, “When Pharaoh says to you, ‘Perform a miracle, ’ then say to Aaron, ‘Take your staff and throw it down before Pharaoh,’ and it will become a snake.” So Moses and Aaron went to Pharaoh and did just as the Lord commanded. Aaron threw his staff down in front of Pharaoh and his officials, and it became a snake. Pharaoh then summoned wise men and sorcerers, and the Egyptian magicians also did the same things by their secret arts: Each one threw down his staff and it became a snake. But Aaron’s staff swallowed up their staffs. Yet Pharaoh’s heart became hard and he would not listen to them, just as the Lord had said”. These demonstrations of miraculous powers were then followed by the two miraculous events that constituted redemption out of Egypt: the passing over of the first born sons of Israel while those of Egypt died on one terrible night and the crossing of the Red Sea and the destruction of the pursuing Egyptians. 3. Presence. Perhaps easily overlooked is the statement of Exodus 13: 18 – 22. “So God led the people around by the desert road toward the Red Sea. The Israelites went up out of Egypt ready for battle. After leaving Sukkoth they camped at Etham on the edge of the desert. By day the Lord went ahead of them in a pillar of cloud to guide them on their way and by night in a pillar of fire to give them light, so that they could travel by day or night. Neither the pillar of cloud by day nor the pillar of fire by night left its place in front of the people”. This developed into the formal structure of the ‘tent of meeting’. Exodus 40: 34 – 38: “Then the cloud covered the tent of meeting, and the glory of the Lord filled the tabernacle. Moses could not enter the tent of meeting because the cloud had settled on it, and the glory of the Lord filled the tabernacle. In all the travels of the Israelites, whenever the cloud lifted from above the tabernacle, they would set out; but if the cloud did not lift, they did not set out—until the day it lifted. So the cloud of the Lord was over the tabernacle by day, and fire was in the cloud by night, in the sight of all the Israelites during all their travels”. The Israelites were instructed to camp by their tribes in a square round the tent (Numbers 2: 1 – 2) “The Lord said to Moses and Aaron: “The Israelites are to camp around the tent of meeting some distance from it, each of them under their standard and holding the banners of their family”. This symbolically indicated the centrality of the Lord amongst his people, Israel. Thus were established 2 apparently contradictory facts about the Lord: unlike all the gods (=idols) of the surrounding nations. He was invisible and he was the God with whom they could have the closest of relationships – no distant, silent, unknowable God was the Lord. So we read in Deuteronomy 7:7–11 “The Lord did not set his affection on you and choose you because you were more numerous than other peoples, for you were the fewest of all peoples. But it was because the Lord loved you and kept the oath he swore to your ancestors that he brought you out with a mighty hand and redeemed you from the land of slavery, from the power of Pharaoh king of Egypt. Know therefore that the Lord your God is God; he is the faithful God, keeping his covenant of love to a thousand generations of those who love him and keep his commandments. But those who hate him he will repay to their face by destruction; he will not be slow to repay to their face those who hate him. Therefore, take care to follow the commands, decrees and laws I give you today”. And above all there is the Shema, Deuteronomy 6: 4, 5, “Hear, O Israel:The Lord our God, the Lord is one. Love the Lord your God with all your heart and with all your soul and with all your strength”, words which the faithful Israelites were later taught to say as their declaration of faith every day. Note that I am not listing the giving of the Law on Sinai as a major part of the Big Story. The people of Israel did not become the Lord’s people by keeping the Law; they kept the Law because they were the Lord’s people. The sequence is exactly the same for us though it must be updated in the light of the story of Jesus. First we need some knowledge of God. There is plenty to be heard and read about him on this website though it is better by far to read it for yourself directly from the Bible, if you have one. Second, we need to experience the action of the Lord on our lives. This is when the Holy Spirit comes to us and turns us round to walk in the Lord’s way. The immediate results in our own lives may not be very obvious, but then what was going on in Egypt probably wasn’t very obvious to the ordinary, average Israelite, who had been making bricks without straw, until they actually crossed the Red Sea and saw the Egyptians drowned. Third, we need to recognize that from the moment of our redemption the Lord, Christ, the Spirit, is at the very centre of our lives. From then on ‘your life is hidden with Christ in God’, or as one paraphrase puts it ‘Christ is the secret centre of your life’! The presence of the Lord in the middle of his people was of fundamental importance for them. Be sure that the presence of the Lord in the middle of your life is of fundamental importance for you! All right – I know I have got it wrong! Abraham came before Israel, but he was part, the first part, of the story in which Israel was the major player so I stick by my heading. Amazingly God’s original plan had not worked out. God had created a perfect world, so perfect that he said it was ‘very good’. Into it he had put a man and a woman and, because they were made in his, God’s, image they had the power of self-will and decision making. And it had all gone wrong. Mankind was unable to relate to God because God was holy and pure and they were neither. What could God do about it – working within his self imposed limits that it would be done through human beings? What God chose to do was to take a man from whom would come a family, and from that family a nation, and give him the responsibility to turn it all around and make it work. That man was Abraham. In the same way that God later said he did not chose Abraham’s descendants because of anything in them but simply because ‘the Lord loved them’. I think we must assume there was nothing special about Abraham. We will never know when or why the Lord spoke to him and compelled him to persuade his father to take his whole family out from one of the best and most comfortable cities of the ancient world, Ur of the Chaldees, and trek over a thousand miles to a small hill country area. The promise the Lord gave to Abraham is of fundamental importance to the whole Biblical story and to the whole world, up to and beyond our present day. Here it is, from Genesis 12: 1 - 3: “Go …. to the land I will show you. I will make you into a great nation, and I will bless you; I will make your name great, and you will be a blessing. I will bless those who bless you, and whoever curses you I will curse; and all peoples on earth will be blessed hrough you. a warning that the world will be divided into those who are blessed and those who are cursed through him. I think, before going any further, I should list what has happened as a result of those 4 ideas. The detail will get filled in as we go through these studies. the land is no longer Israel. Paul said that ‘Abraham would be heir of the worlds”. Romans 4:13.
the many descendants are not just national Israel, indeed not really national Israel much at all now but us! Paul said: If you belong to Christ, then you are Abraham’s seed, and heirs according to the promise. Galatians 3:29.
the great blessing has come through Jesus Christ: his life, death and resurrection. So all these things said to Abraham more than 3000 years ago are still important today. But, in fact, it is more than a promise. If you buy a book from a friend you promise to pay. But if you buy a house from a friend something more than a promise is needed. You are into the world of lawyers, legal documents, and a covenant – an unbreakable agreement between the two of you. And the Lord sealed a covenant with Abraham in Genesis 15: “The Lord said to him, “Bring me a heifer, a goat and a ram, each three years old, along with a dove and a young pigeon.” Abram brought all these to him, cut them in two and arranged the halves opposite each other; the birds, however, he did not cut in half. Then birds of prey came down on the carcasses, but Abram drove them away. As the sun was setting, Abram fell into a deep sleep, and a thick and dreadful darkness came over him. When the sun had set and darkness had fallen, a smoking firepot with a blazing torch appeared and passed between the pieces. On that day the Lord made a covenant with Abram”. That describes what we would think a very curious procedure, but it was the way they did covenants in those days. It was the way a high king made an agreement, a covenant, with a lesser king. The high king would protect the lesser king from other high kings. The lesser king would provide fighting men to form part of the high king’s army when he needed it – perhaps to defend another lesser king from another high king. The situation between the Lord and Abraham was sufficiently similar for the procedure to be applied. The fundamental statement on which Abraham and eventually the whole Biblical story is centered is Genesis 15: 6. “Abram believed the Lord, and he credited it to him as righteousness.” Paul uses it in Romans 4: 9 when he says: “we have been saying that Abraham’s faith was credited to him as righteousness.” Here faith/faithfulness/believing loyalty is established as the necessary and only prerequisite for a relationship with the Lord God. All other subsequent attempts to add various activities and actions in worship and living are just plain wrong. The story unfolds with many ups and downs through the lives of Abraham, his son Isaac, his grandson Jacob who had the 12 sons who began the 12 tribes of Israel, and his great-grandson Joseph who, with the best of intentions, moved the whole 12 families down to Egypt. The return from Egypt, some 400 years later, the Exodus as it s called, is the next major event in the Biblical story. The first outstanding thing Abraham did was to make a journey, a huge journey, particularly huge for a city boy, through wild country, difficult country past bandits galore. He didn’t get it all right. We read in Genesis 12 that he failed to stop in the hill country he was to be given when he should have done. He kept going, eventually reaching Egypt and big trouble. We too have a journey to make – the journey of faith. We too won’t get it all right; we will make mistakes. But if we walk in step with the Spirit of Jesus we shall get there. The second outstanding thing Abraham did was to obey the instruction from the Lord to take his only son, on whom all the promise of descendants rested, to the hill of sacrifice where he was only stopped at the last minute from killing him as a sacrifice (something far outside what we would ever consider possible). That was a huge test and we may well hope that nothing like that will ever come our way. But to go back to the journey idea – some preachers make it sound as though all that matters is being born again. But we are born to a new life, not to a static state of eternal babyhood. The beginning matters, as a wedding matters, but it is the marriage that determines what the real outcome is. Not for nothing is the Christian life called the Way in the book of Acts; Jesus said follow me; he describes himself as the shepherd who leads where the sheep are to follow. What is the Way you are going? Question: what has been your biggest disappointment, the moment when something really special you had planned, or made, or hoped for did not work out and your dreams came crashing to the ground? It seems rather extraordinary but that seems to be what happened to God, the Designer and Creator of all that is. He had planned and built the perfect world for Adam and Eve and their descendants, put them in the most perfect garden ever, and they – the two of them – had immediately spoiled it and brought the whole scheme crashing to the ground. I know we say God knows everything including the future but in the introduction to the story of the Flood we read that the LORD regretted that he had made human beings on the earth and his heart was deeply troubled. God was disappointed – whatever the systematic theologians may say are his attributes. So Paul says: sin entered the world through one man, and death through sin, and in this way death came to all people. But that is not the end of the problem. We have 3 more accounts of the sinful nature of people in the next 8 chapters. First: Cain and Lamech commit murder. Second: things get so universally bad that God sends the great Flood. Third: mankind, again in the plural, get so above themselves God has to organize the confusion of languages at Babel. Not a good set of stories! But we need to start at the beginning. The story of Adam is important for many reasons. The one I would highlight as very significant but often overlooked is the fact that we are being told humankind started in just one place with just one person. Men and women did not become spiritual beings made in the image of God through the slow evolution and development of many people. No. Only one person, Adam, was created as a true fully human being. Because he was male there was a problem! In most ancient stories of the beginning of humanity the first person was female, which made things much easier because then others could be born from that first person. But Adam was male so Eve was made from his side. That is realistic because the human world is a male dominated world simply because men tend to be stronger than women. We may not like that – particularly if we are female – but that is the way it is. Only with Jesus, the way he treated women, and the early church, and the way they gave women an equal status with men, do we begin to see the raising of women towards equality with men. Then in the last few decades with the increasing sophistication of modern machinery needing brains and skills of dexterity rather than strength, women have started to equal men in their work place skills – but that is another story! When Paul said “all have sinned” he made the most accurate statement ever of the nature of men and women. Sin and evil cover this world of ours as we can see from any daily newspaper or TV news bulletin. Some try to say mankind is getting better and better but there have been more terrible wars and more ghastly treatments of man by man in the last 100 years than ever before. The Bible story continues with the murder of Abel by Cain. “Am I my brother’s keeper” asked Cain thinking the answer was “no”. Jesus pointed out that the much better answer is “yes” by telling the story of the Good Samaritan. The fourth and final story of the descent of the human world into the mess of sin and evil that became its standard state is the story of Babel. The multiplication of languages is depicted in this striking image. Biblically the reversal of this commenced at Pentecost when we read in Acts 2 : “When the day of Pentecost came, they were all together in one place. Suddenly a sound like the blowing of a violent wind came from heaven and filled the whole house where they were sitting. They saw what seemed to be tongues of fire that separated and came to rest on each of them. All of them were filled with the Holy Spirit and began to speak in other tongues as the Spirit enabled them. Practically, on a world wide view not much changed – until now – leading to our present dependence on the World Wide Web and the consequent dominance of the English language. We live in surprising and exciting days. Babel is not, and never will be, completely reversed. But in our lifetimes one language, English, has become more widely understood than any other ever has been since Babel. More people speak Mandarin or Spanish as their first language – their mother tongue as we call it – than do English. But the effect of the Internet has been that more people can now understand or even speak English than have ever been able to do so with any other language. A good example of that is what you are listening to or watching right now. Dave Roberts is one of those who have caught the vision of what is possible today, in English, through his Partakers site. Make sure that you make the most of these opportunities. If your mother tongue is not English you may struggle a bit to follow all he, and we, say or write. Persevere – use a dictionary if we get above ourselves and use unusual words. Sorry! Just one question – who do you share it with? It doesn’t matter if your translation is not perfect. Make the most of it you can. Turn it into the language of those of your friends who have less English than you have. Share the glorious news of the Good news of Jesus as much as you can and the LORD will bless your every word. WOW. Question: which is your favourite television programme? Very probably your answer is either a “soap” (a series of episodes telling the story of a family or a group of people) or a series of linked episodes solving various crimes, containing the same central characters. Both of these are stories – and we love stories. When a girl meets a new fellow she may well ask “ tell me about yourself”, by which she does not mean the sort of list of accomplishments that would be appropriate in a job application. She wants to hear about things he has been involved in, people he knows or has met, strange things that have happened to him. Quite how we come to understand someone on the basis of disconnected small stories like that is not at all obvious. In His wisdom God has told us about himself through stories, some connected, some disconnected, some big, some small. Quite how we can come to understand something about God this way is not clear but we do. By story I do not mean some thing that is not true. Scholars call true stories ‘narratives’ but that is too posh a word for us! The Bible is one huge story, the greatest story ever told. But we tend to read it and hear about it only in small disconnected chunks and have never heard any attempt to put the most important parts of it together as a big, continuous story. This set of studies aims to put that right! (Even although much modern thinking rejects the idea of big stories, thinking they only function as a method of control. But then perhaps God knows better than the moderns.) at best this story will only partly succeed because the Bible is so infinitely varied everyone sees different, hidden depths in it. There are 5 major parts to the story – I will call them Acts, as in a play, some of them subdivided into Scenes. These are headed: the Creation, the Fall, Israel, Jesus and the Church. I am going to tell the story as I see it. There must be a nearly infintite number of ways the Story could be told. This is mine. I hope you enjoy and learn from it. Very obviously the first one is Creation. In 5 days God created the non-human world. Here that is in Genesis 1: 1 – 23: “In the beginning God created the heavens and the earth. Now the earth was formless and empty, darkness was over the surface of the deep, and the Spirit of God was hovering over the waters. And God said, “Let there be light,” and there was light, then a separation on the second day, vegetation on the third day, visible lights on the fourth day, living creatures on the sea and the air on the fifth day and on the ground on the sixth day. And – we are told of all these things that - God saw that it was good.. There is no conflict between Science and the Bible, as is often suggested. There cannot be because they are different sorts of things. Science is man’s understanding of the raw data of the natural world. The Bible is also raw data. Theology and Bible Study are man’s understanding of what the Bible says. Science certainly can, and does, conflict with theology and our understanding of the Bible. The natural world and the Bible are two different types of raw data, both God-given and therefore not in conflict. The natural world is our best source of information about how and when God created. The Bible is our only source of information about by whom and why. Hundreds of years ago they used to talk about the ‘perspicuity of scripture’. By that they meant that it was easy to understand, transparent to everyone, even every ordinary person. You don’t have to be a theological genius to know what it is saying to you. (Obviously the more you know about the context of scripture the better, but you don’t have to go to Bible College to work out what it is all about.) The same thing is true of the natural world. You don’t have to be a scientific genius to know what the world is telling us about God. It is not immediately obvious that we ordinary, created human beings can understand the ways of the Lord, in both his written word and his created world, but it is so. It is important to keep a balance between these two so different lines of thinking about the creation of the world and all that is in it. In the beginning God created the heavens and the earth and everything that is in them. So the answer to “by whom” is God, though what exactly that means we shall only get a glimpse of even when we have looked at all the Big Story of the Bible. This is emphasized in quite a subtle way when those first few verses refer to the sun and the moon as just ‘those lights in the sky’ not even giving them names. That is clearly done to avoid any least suggestion that they had anything to do with the creation, since they were considered to be gods in most ancient religions. “Why” is answered in the remainder of Genesis Chapter 1: verses 24 – 31. It is for the glory of God and then, quite astonishingly, for us, for mankind. We are not just specially developed animals who happen to have developed much further than any other creature. We are those for whose blessing and enjoyment everything was created. Wow! But don’t jump to the wrong conclusion. It is still God’s world. Sadly, mankind seems to have decided that it can do what it likes with it: rip it apart, use it up, dirty it, pollute it, empty chemicals into its rivers etc. in the hope that it will all work out all right in the end. One day the day of reckoning will come. We, and we alone, are made in the image and likeness of God. That means, I think, many things. We alone can reason, can think, can understand – amongst other things that death lies inescapably ahead of us – can love beyond the bounds of sexual desire, can think a long way ahead of the consequences of our actions – at least when we want to do so. To put it in very modern language, our brains, unlike those of any other creature on this earth, are, in computer speak, almost completely full of RAM, not the ROM that fills animal heads. RAM is random access memory where there is no information until some is put there; ROM is read only memory where the information has already been put there and cannot be changed or developed much. We humans, on the other hand, have to learn to speak, to walk, to understand just about everything concerning the world around us. Our brains have to learn, to be filled with knowledge. Animals are born with most of the things they need to know already implanted in their brains. That is a huge and wonderfully significant difference. Those two words signal my comment as to what the immediate practical implication of the this passage, this part of the Big Story, means for us – for you and me – today. We are created in the image of God. Sometimes Christians get so excited by the next two chapters of Genesis that they think of everybody as simply “sinners” to the exclusion of these important and thrilling facts. Those who are not Christians, just like those who are, have these two directly conflicting aspects to their lives. We are both made in the image of God and fallen sinners. Sometimes one dominates; sometimes the other. So your unbelieving neighbour one side may be the most delightful, helpful, loving person you could wish to meet. Your unbelieving neighbour the other side may be the most unpleasant character, impossible to carry out any sort of decent conversation with, always getting into arguments and fights and probably a thief. Those are the ways we naturally are. Neither person is acceptable to the LORD God if they have made no attempt to enter into relationship with Him. That is the way we naturally are. We need to hold firmly in our minds our understanding of human beings as both God images and sinners and be careful to understand our world in the light of those two facts. Only as a consequence of the death, and resurrection of Jesus and the gift of the Holy Spirit to those who have set out to follow him can we be any different.